My Game Developers Conference 2004 session and paper. new» An updated overview over many particle system simulation techniques has been given as a talk at the Game Developers Conference 2007. Additional research on this topic, including collision of particles with arbitrary geometry, has been published in a paper at the Graphics Hardware 2004 conference. This paper introduces a full GPU implementation of both the simulation and rendering of a dynamically-growing particle system. 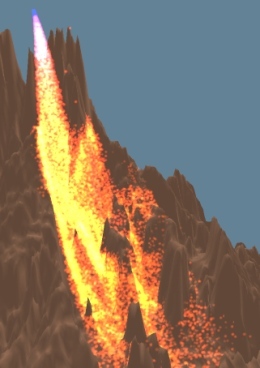 Such an implementation can render up to 1 million particles in real-time on recent hardware. It helps you to dramatically increase the level of detail and allows you to simulate much smaller particles. Thus it goes back again towards the original idea of a particle being a minimal geometry element. Thanks go to my former colleagues from Massive Development for their support!